The site of one of the largest and most significant former border crossing points between GDR territory and West Berlin. Here, a main artery of the so-called "transit routes" fed into West Berlin, primarily for road traffic coming from the equivalent GDR-FRG border crossing point at Marienborn-Helmstedt. The one at the border to West Berlin was officially called Dreilinden Drewitz. 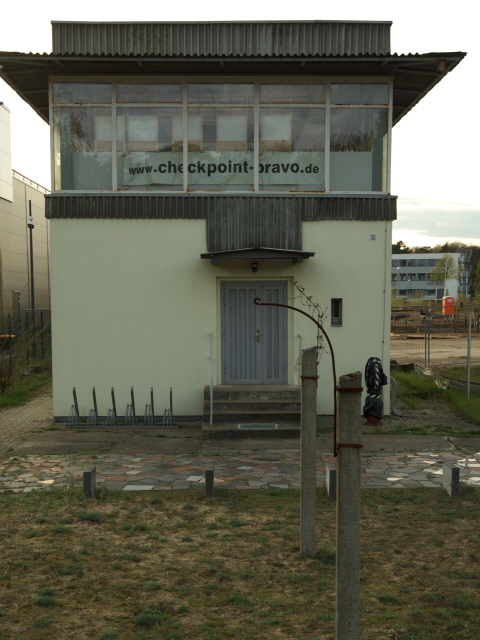 In addition, there was the second of the three Allied checkpoints here, hence the designation "Checkpoint Bravo" ... the other two were Checkpoint Alpha near Marienborn/Helmstedt and, of course, the (in)famous Checkpoint Charlie between East and West Berlin. More background info: Like two sides of a coin this is actually two sites, connected but apart, so they have to be seen separately: The Checkpoint Bravo of the Allies, in this case the USA, in whose sector of West Berlin it was, on the one hand, and the “Grenzübergangstelle” (GÜSt), 'border crossing site', of the GDR on the other. The Allies used the term “checkpoint” to avoid the word “border” specifically so as not to acknowledge the legitimacy of the communist German state GDR. The terminology was kept even after the GDR was de facto recognized as an independent country even by West Germany in the 1970s. Strictly speaking the Dreilinden-Drewitz GÜSt lies outside the territory of Berlin and is now in what's become the new federal state of Brandenburg (see also Potsdam), but because it's intrinsically linked with the story of the division of Germany and Berlin during the Cold War era it is covered here under the Berlin Wall umbrella. Until 1969 the route into Berlin and the border crossing points lay further south-west. That route, however, crossed through the West Berlin quasi-enclave Albrechts Teerofen and then back into GDR territory (where there were no further checks) before reaching West Berlin proper. And that was seen as a potential border security issue. So the GDR built a new motorway route to connect with Berlin's “Avus” city motorway further east. Even though the new crossing now lay in the village of Kleinmachnow, the old name Dreilinden-Drewitz was kept. The newer GÜSt Dreilinden-Drewitz was once the largest of all the border crossing checkpoints of the GDR (in fact the largest in Europe). It covered a vast area with various buildings with different functions, including passport checks, customs, Stasi offices, interrogation rooms (for those found to be suspicious) and much more – very much like the infrastructure at Marienborn, the equivalent GÜSt between the GDR and West Germany. On 9 November 1989 an erroneous press conference statement by Günter Schabowski (see Bornholmer Straße) made thousands of GDR citizens flock to the border crossing points demanding to be let out. The same happened at Dreilinden-Drewitz, though here the border security held out a bit longer than elsewhere and only gave up holding people back after midnight, so on 10 November. After that it didn't take long for the border fortifications (including most of the Berlin Wall) to be taken down quickly. The now redundant border checkpoint was thus abandoned too. Most of the facilities were dismantled and the buildings demolished. Meanwhile the area has been redeveloped into a business quarter called "EuroParc". Several companies have set up a base here, including eBay and PayPal. Only the commandant's watchtower that overlooked the whole border area survives today, thanks to the initiative of a local association that formed with the aim of saving it and turning into a memorial. They succeeded. Inside there is now a seasonally open exhibition, complemented by some open-air parts right next to the tower. Dreilinden-Drewitz is also part of the “Mauerweg” ('Berlin Wall trail') and a few of the information stelae of the same uniform design are located at this site too (see also below). The structures of the former Checkpoint Bravo, in contrast, are largely still there but have found either other uses (a customs office), lie abandoned or are also undergoing redevelopment. What there is to see: The only building that survived of the former GDR border checkpoint Dreilinden-Drewitz is the old watchtower from which the checkpoint's commandant could oversee the whole area. After the fall of the Berlin Wall and the opening of the border the checkpoint became redundant and was gradually demolished for redevelopment. The development is still ongoing and is increasingly encroaching on the old watchtower – giving it a rather incongruous backdrop of shiny new commercial buildings. When I was there in April 2017, the plot of land directly adjacent to the tower was also being dug up for the laying of the foundations of yet another business development. So I guess very soon you won't even be able to see the tower from within the EuroParc at all any longer. You can only catch a quick glimpse while driving past on the motorway. To get to the tower you have to walk down a path from the intersection of Albert-Einstein-Ring and Stahnsdorfer Damm. At the head of this path stands a small windowless building, probably a kind of electrical substation, part of which is painted with an artist's impression of what the old border checkpoint would have looked like from the air. Opposite this are three stelae of the Berliner Mauerweg commodification design (see Berlin Wall) with bilingual (German and English) text-and-photo panels. One of these gives a brief general overview of the Berlin Wall/border, another provides some statistics of fatalities at the Wall, and a third describes a particular case that was especially tragic: that of a small child that suffocated to death while fleeing to the West through Dreilinden-Drewitz with his parents in 1973. The path to the watchtower then runs down parallel to the bridge that takes Stahnsdorfer Damm across the motorway. At the bottom of the path, turning right, there is a set of ten further information panels on rusty iron stelae. These form the open-air part of the Checkpoint Bravo association's exhibition entitled “FREUNDwärts – FEINDwärts” ('friend-facing, enemy-facing' – see under Berlin Wall for the GDR border terminology alluded to in this!). All these text-and-photo panels are in German only. They too provide some general information about the history of the division of Germany and the Berlin Wall and more specifically about this particular border crossing point. They also recount a few stories of successful as well as failed attempts at fleeing to the west. 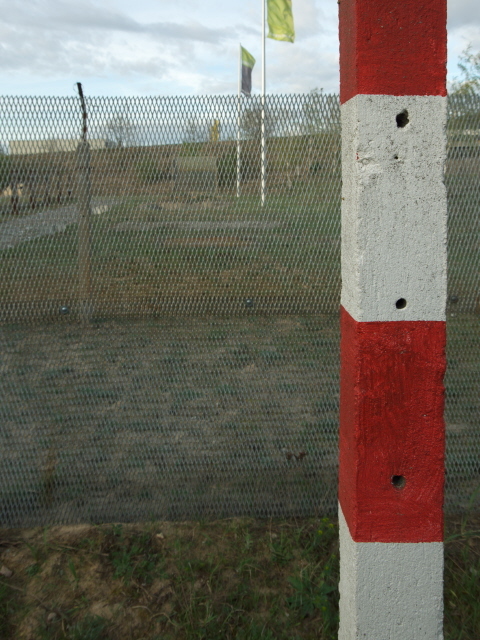 In addition there are a few relics of the border fortifications on display in front of the tower: a bit of border fence, some poles with remnants of barbed wire and a part of a concrete road barrier from the checkpoint. The exhibition inside the watchtower was still closed when I visited the site in April 2017 (it's only open in summer – see below), so I can't report any first-hand impressions. But going by photos I've seen I gather that it too consists of (monolingual) text-and-photo panels plus the odd artefact. Presumably it tells the history of the place and the GDR border in a little more detail than the open-air part. The former Allied Checkpoint Bravo is a bit up the motorway towards Berlin Zehlendorf. The original buildings are still there – the main one looks like a typical 1970s motorways service station of the sort that has a restaurant in a bridge over the motorway. But this isn't a restaurant nor is it regularly accessible for tourists. It now houses a customs office, so it's not publicly accessible inside (unless you pretend to have some customs-related query ...). The only indication of its former role is the fact that there's still the sign over the door saying “Allied Checkpoint Bravo / entrance-entree” (yep, in French too). In between the two checkpoints, still on former GDR territory there used to be a tank memorial, a typical T-34 on a plinth (as found all over the former Eastern Bloc), with its cannon aimed at West Berlin. This was taken away after Germany's reunification. Instead there is a snowplough vehicle painted pink atop the plinth (it's an artist's installation). A very odd sight. More of the border remnants in the area are described below. All in all, it's a long way out for not very much, but for dedicated Berlin Wall tourists it's still a must-see. For others perhaps not. Location: rather remote, next to the relatively new A115 motorway (the result of a modern upgrading of the former transit route) on the border between Berlin and Brandenburg, eastern Germany, a few miles east of Potsdam. The Dreilinden-Drewitz former GDR checkpoint with the watchtower and exhibition is next to a new business estate called “EuroParc”. The former allied Checkpoint Bravo is further up the motorway towards Berlin, just inside the district of Zehlendorf. Access and costs: in part quite easy to get to by car, less so by public transport, and some parts require a bit of walking in any case; the watchtower exhibition has very restricted opening times, but free admission. Details: If you have your own vehicle (or hire car) it's quite easy to get to the former GÜSt Dreilinden-Drewitz. There's a motorway exit right at the southern end of today's EuroParc business quarter. It's exit No. 5 called Kleinmachnow. Heading north on Stolper Weg take the first exit at the roundabout into Albert-Einstein Ring. This eventually leads past the path to the watchtower. You'll have to find parking elsewhere though (e.g. further up the road or on Stahnsdorfer Damm). To get to the former Checkpoint Bravo – other than driving past it on the A115 motorway, you have to approach the motorway intersection Zehlendorf from the west, turning off the B1 road (called Potsdamer Chaussee here) at Isoldestraße and head south, then east, then south again to get to the abandoned checkpoint and the customs office. Note that you CANNOT get there directly from the motorway any more! By public transport you can get close to these sites by first getting the S-Bahn (regional metro train) lines S1 or S7 to Wannsee and then take a bus (line 620) for 5 stops to Kleinmachnow/Albert-Einstein-Ring for the former Drelinden-Drewitz GDR border crossing point. Getting out at Isoldestraße (two stops from Wannsee) gets you relatively close to the former Checkpoint Bravo (see driving directions above). These buses are not particularly frequent though (20 minutes to half-hourly). From Wannsee station you could also walk it all, as it's only about a mile (1.5 km). Opening times (watchtower): from ca. mid-May to late October (exact dates vary from year to year – best check ahead), every Sunday between 11 a.m. and 4 p.m. If you want you can also stay overnight, you can find accommodation right within EuroParc, where there are two decent budget hotels (with car parking). And there is also the simple hotel right by the Teltow Canal next to the camping site. The latter is of course also another cheap option for those who like such places. Options for food and drink are quite limited in this area, however. Time required: Not long for the actual Checkpoint Bravo watchtower and the surrounding open-air info panels, maybe between half an hour and 45 minutes – but you can spend a few of hours poking around the old Checkpoint Bravo buildings and especially the former borderland and its relics (see combinations below). Combinations with other dark destinations: Before the second and final incarnation of the border-crossing point was constructed at Kleinmachnow, a predecessor was in use in a slightly different location a bit further to the south-west. And here some relics of this checkpoint and the surrounding borderlands can still be found. It's about a two-to-three miles (3 to 4 km) walk from EuroParc/Dreilinden-Drewitz, first towards the village of Dreilinden then along the banks of the Teltow Canal. 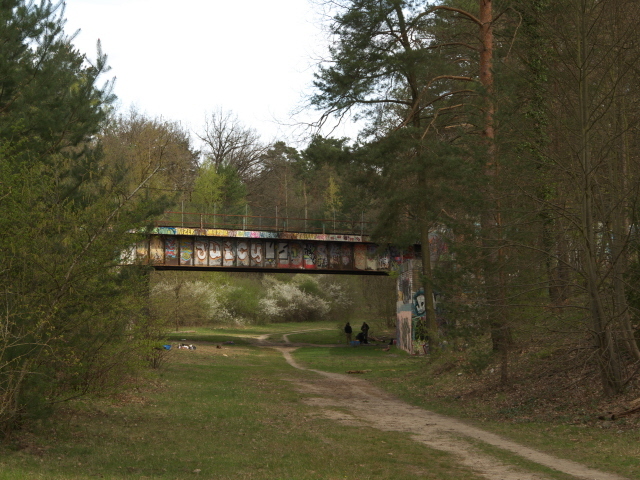 The largest relic is the old motorway bridge that used to take the old route into Berlin across the Teltow Canal. Just south of this was the border checkpoint. Only a few markings on the road, e.g. “Bus” and “PKW” (for 'passenger cars'), and a set of three abandoned flagpoles remain to be seen (the latter these days sans the Allied flags they used to fly). A bit further on is the ruin of a former restaurant of the ex-service station. 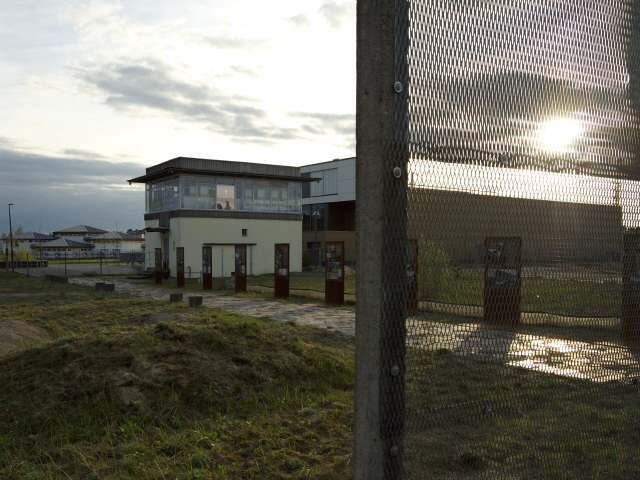 It is the last surviving building of the former border-crossing point (the rest was demolished as early as 1971). You can still make out the letters “Raststätte Dreilinden” at the front of the building. When I was there (April 2017) it was boarded up and surrounded by a fence, so maybe some restoration work is imminent (or “redevelopment”?). These parts are located in what used to be the quasi-exclave of West Berlin that is so quaintly named Albrechts Teerofen ('tar oven'). The area is part of the “Berliner Mauerweg” (see above and under Berlin Wall) that has been commodified by bilingual information stelae. A set of these can be found just round the corner from the ex-“Raststätte”. Heading back across the bridge you can follow the Mauerweg a bit further north. The sandy open spaces you see between the wooded areas are what used to be the death strip of the former border. More information stelae are to be found here too. One of them recounts a particularly nasty story of victims of the border: a West Berlin couple took a boat trip from Wannsee into the Teltow Canal towards the borderline. As they got close, the border guards fired warning shots. And even though the boat turned around and headed for the West Berlin shore they fired targeted shots that killed the man and seriously injured the woman. Further up still you come to an ex-railway bridge that has now been given over to graffiti sprayers. The former motorway that ran under the bridge has disappeared completely. 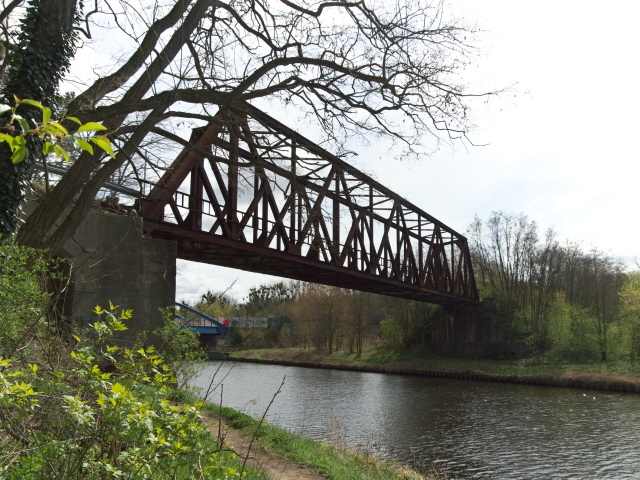 Another abandoned railway bridge can be found close to the new bridge that takes the A115 motorway across the canal. 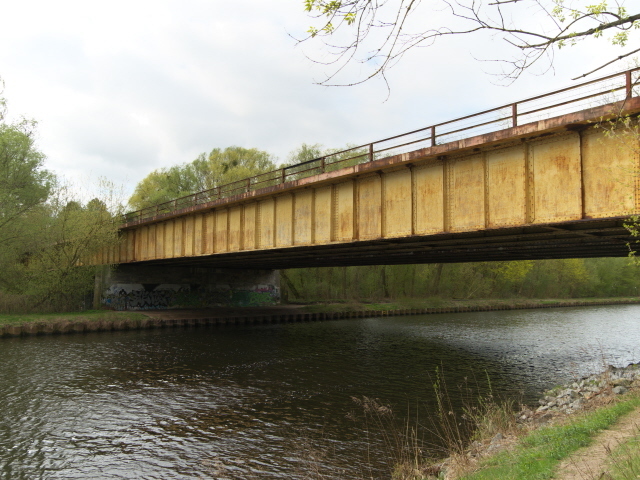 The old rusty bridge was for the Berlin S-Bahn (regional metro train) line that used to end at Stahnsdorf before that village ended up on the other side of the border in the GDR. The bridge is just behind the small hotel by the Teltow Canal next to a camping ground. Within the latter stands another relic of the GDR border: a waterways watchtower – see under Berlin Wall > watchtowers. It now houses a cafe – but it's only accessible for guests from within the fenced-in camping ground. A completely unrelated dark site (and a very, very dark site that is) can also be reached from Dreilinden-Drewitz: The House of the Wannsee Conference. First walk or take the bus to Wannsee station (line 620) and then get a bus (Line 114) from there to the villa or walk it. For more sites further away see under Berlin and Potsdam. Combinations with non-dark destinations: Nothing much really, other than the walks through the former borderland where nature has reclaimed the territory, which now makes for a peaceful and quiet area for just taking a walk. But for proper tourist attractions you'd have to either head into Berlin or get yourself to Potsdam, which is only a few miles further west. Either can be reached by the S-Bahn (regional metro trains) from Wannsee station, which is within doable walking distance (or take bus 620 – see above).